The STIHL RT6127 ZL offers you a combination of modern technology, top cutting quality and a modern design. 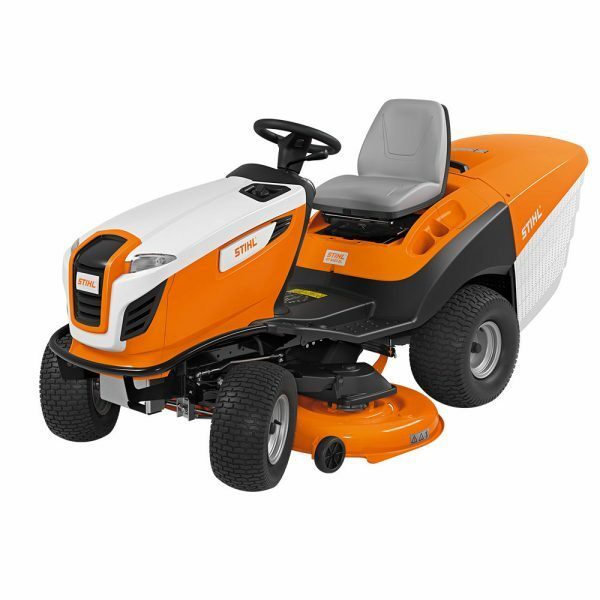 Featuring lots of practical features and a powerful 2-cylinder engine, mowing larger areas of lawn is almost effortless. While the cutting width of the lawn tractor offers fast and efficient mowing, the synchronous mowing deck, simple to adjust cutting height adjustment and catching management system collectively ensure a high-quality finish to your lawn. With single-pedal self drive and a single lever to change direction, the main controls of the RT6127 ZL are simple use and quick to master. For added convenience when driving, the cruise control can be conveniently activated at the press of a button. You can therefore control the speed of your STIHL ride-on mower automatically and continue to work tirelessly. The LCD display clearly shows all the important information, even in bright sunlight. The clippings are collected in the 350-litre capacity grass catcher box which has a “dumper” style design to ensure all clippings are emptied. Thanks to the adjustable grass level indicator you always know when it is time to empty the catcher box. The RT6127ZL comes with a 5 year extended warranty (subject to registration and annual servicing).